Tall spires of gorgeous flowers in a sweet-shop confection of colours! Simple to grow - all the energy needed is already in the bulbs. Makes simply stunning cut flower displays! Supplied as a mixed pack of 100 bulbs in at least 8 colours, size 8/10 corms. Will reach 90-120cm tall. Flowers July & August. 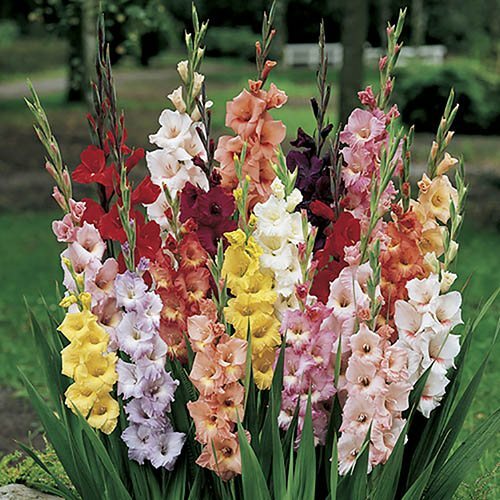 Imagine tall spires of Gladioli in a sweet-shop confection of colours, bursting skywards in full Summer. They really are so simple to grow, each bulb primed to burst into life this Spring. Each bulb will give one sensational stem of flower this Summer, which can be cut for the house when in tight bud, or left to brighten your garden. Pretty hardy, they have survived the last 3 Winters in Martins garden, providing bigger and better displays the following year. Extremely easy and low maintenance, and yet very rewarding and at less than 10p each, incredible value for money too!! Supplied as a mixed pack of 100 bulbs in at least 8 colours, size 8/10 corms. Will reach 90-120cm tall. Flower July & August. Supplied as a mixed pack of 100 bulbs in at least 8 colours, size 8/10 corms. Will reach 90-120cm tall. Flower July & August.